The calming effect of candlelight can be the first step in reducing stress and increasing self-awareness. Bring the tranquil and restorative light of candles into your daily life. Known for our wide selection, here are a few of the candle lines you’ll find at Dixboro! Our best selling candles! Kringle Candle unites the best of the traditional and the new. By working hand-in-hand with the industry’s finest perfumers, Kringle Candle has selected an array of robust, realistic candle fragrances. It doesn’t matter which fragrance you select, because each of these carefully crafted candles are an ideal color match for any room! The 100% dye free Kringle Candles also yield the most possible light! But best of all, each candle will fill your home with lush, long lasting fragrances. And isn’t that what you want most from a scented candle? Soy wax candles are taking candles to a new level, and we just found some that we loved so much, we’re willing to put our name on them! 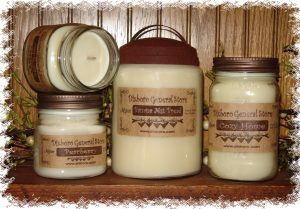 Made right here in Michigan, these all natural hand poured candles have rich scents and use the finest and highest possible percentage of fragrance. Soy burns longer and cleaner than most wax candles, and the soy oil is generated by, and supports, the American farmers! With room filling scents such as Apple Pie, Banana Nut Bread, Magnolia, Orange Cupcake, Cozy Home, and Vanilla, it won’t take long until you’re experiencing the Joy Of Soy! If you’re someone that prefers not to have candles burning, there’s another way the get fragrance throughout your home: Thompson’s Super Scented Crumbles! 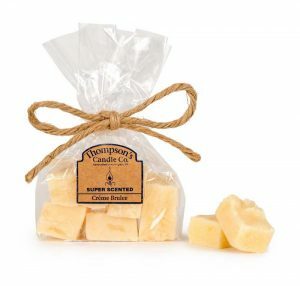 The Thompson Candle Company has been crafting their wax melts in Pennsylvania since 1997. When placed in a warmer, the melted wax creates scents that are true to life and room filling! When you want to switch fragrances, simply turn off your warmer, allow the wax to harden, pop it out, and melt another choice! 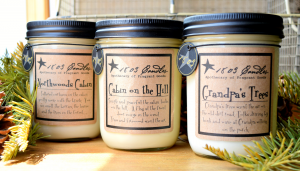 Soy candles by 1803 Candles were inspired by the 1803 diary writings of Martha Ballard. She made tallo candles, dozens and dozens almost every day and stored them in the cellar. Candles provided their light from dusk to dawn. Unlike in 1803, we now use candles to illuminate our homes with a warm light; for comfort, ambiance and cozy fragrance. Each 1803 Candle handmade everyday with American made Soy Wax, and is then labeled with a story reminiscent of simpler times. 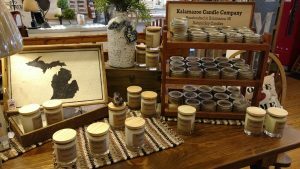 Our newest candle addition: locally made Kalamazoo Candles! Founded in 2013, Kalamazoo Candles are made using soy wax, paper wicks, and zero added dyes, so they’re about as natural as it gets. Each candle burns cleanly and evenly, releasing fragrance throughout the entire burn. They take great pride in crafting candles that perform as good as they look. That’s why it takes three months to completely test each new fragrance, and why every candle is poured by hand.